Demonstrations are a regular feature of international climate meetings, and solidarity marches in places far removed from the climate talks have equally become popular over the years. Over the past weekend, thousands of people in cities across the globe took to the streets to march for an ambitious climate agreement in Paris, demanding firm action as global leaders readied themselves for the negotiations, and hoping that the Paris meeting will be a turning point for curbing global warming. 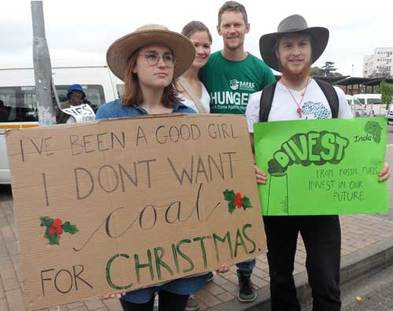 On Saturday, Johannesburg civil society went all out in raising voices against climate criminals in South Africa. This is one amongst many actions civil society is taking to send a message to those who are negotiating in Paris COP21 that our collective back is up against the wall, and there is not anymore time to waste, and that we need to act now. The procession started at Westgate taxi rank in Johannesburg where a number of organisations affiliated to Earthlife Africa Johannesburg. The march was overwhelmingly constituted of community activists from Midrand Solidarity Economy Education Communication Cooperatives, Sisonke Women’s Club, Inner City Resource Centre, Orange Farm Water Crisis Committee, Youth Agricultural Ambassadors, Divine Green Co-op, Vaal Environmental Justice Alliance, Go Green Tembisa Environmental Forum, Masakhane Civic Association, Riverside Community, Displaced Rates Payers Association, Kwa-Thema Working Group, Treatment Action Campaign, Poritjie, Thabeng Tsa Mogale, Evaton West Faith Based Organisation, and Sphamandla Community Based Organisation. We proceeded to the Chamber of Mines offices on Marshall Street where Earthlife Africa, represented by Makoma Lekalakala, spoke out against climate criminals, demanding that they reduce their emissions. We acknowledged that our economy is based on extraction of fossil fuels and minerals, but stated that we need a just transition to a low carbon economy based on renewable energy. Unemployment levels are high in large part because of our country’s mineral energy complex, which impacts on food production, health and environment. We then went to Standard Bank offices where our message was: banking institutions should stop investing inn dirty economy and direct investment into low carbon economy. We continued to Gandhi Square where we called on Nedbank to walk the talk and stop investing in coal while claiming to be a green bank. From there we walked through the Johannesburg CBD to the Eskom regional offices in Braamfontein where many organisations stated loud and clear that we should leave coal in the hole. At the same time we sent a message to parties at COP21 that the INDCs that they are going to table should make sure that the global temperature does not rise beyond 2 degrees Celsius, and more funding should be availed for adaptation, with due attention afforded to mitigation.